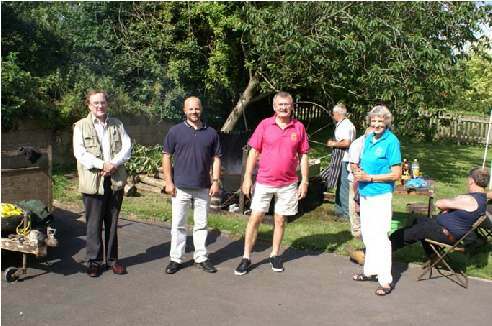 On Saturday 4th July the Four Shires Guild celebrated their 100 years of existence by holding a celebration Pig Roast at Todenham Village Hall in the late afternoon. A real ale, brewed by The North Cotswold Brewery at Ditchford near Moreton-in-Marsh and named Four Shires Centenary Ale (4.5% ABV), was also served. Four afternoon ringing tours were run, one from each county, and all finished at Todenham, where ringing continued until 8 o'clock in the evening. 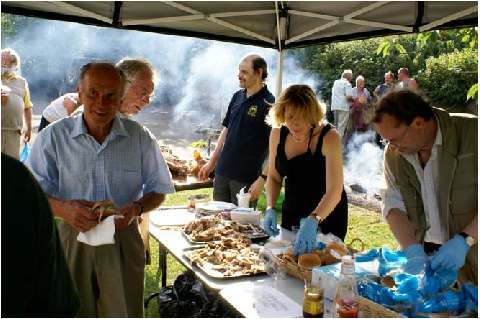 The weather was superb and the event, attended by about 80 people, was held in the grounds of the village hall, where the pig was carved and the ale consumed. John White oversees the pig roast.